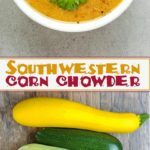 This light “corn chowder” style soup gets all of its creaminess from the zucchini, no dairy is needed. The corn flavor is intensified by simmering it with the actual corn cobs. From here, you can spice it anyway you’d like – this Southwestern version of one of my favorites. Garnish the soup with your favorite southwestern toppings, like cilantro, peppers, or even some crunchy tortilla strips (they are really easy to make). And for those hot sauce lovers – pour it in! I often pair this with a baked potato for a light summer dinner. While I enjoy this “corn chowder” and make it several times each summer, I wouldn’t expect guests to rave over it. You know me, I like to set proper expectations – no one wins if I over-sell a recipe! A creamy southwestern corn soup without the dairy. Chop the shallots and garlic, set aside. Cut the corn kernels off the cobs, over a rimmed baking sheet so they don't fly all over the counter. Using your hands, break the empty cobs in half if possible. Cut the zucchini into 1/2 inch chunks. Cook shallots: Add the olive oil to a large soup pot. Once hot, add the shallots and garlic, cooking until fragrant, about 3 minutes. Add spices: Stir in the spices, chipotle peppers and salt. Mix, cooking for about 1 more minute. Add veg & broth, boil: Add the corn kernels, corn cobs, zucchini and broth to the pot. Bring to a boil, then simmer, with the lid off, for 30 minutes. Remove the corn cobs, and puree the soup. If it's too thick, add water to thin it out. Taste the soup for saltiness and flavor. Adjust as needed. Depending on the saltiness of your chicken broth, I expect you might need to add another 1/2 tsp or so. Garnish with cilantro, chopped jalapenos or red pepper flakes. *These are completely optional, you can replace it with chipotle powder or more paprika or chili powder. You can find them in the Mexican isle in the grocery store, by the canned diced chilies. Calories are not a perfect measure, not by any means. However, they are very helpful to put things into perspective. A soup that has 500 calories a bowl is quite a bit different than one with 200 calories. I also like to look at the nutrition per ingredient and try to balance daily vitamins. Yellow or green zucchini – You won’t notice a flavor difference, but the color will change slightly. If you use green zucchini, the soup will be a little more ‘spring green’ or slightly brown after adding in red spices. Yellow zucchini let the soup be yellow or orange (after the spices). Other than appearance, it doesn’t matter. 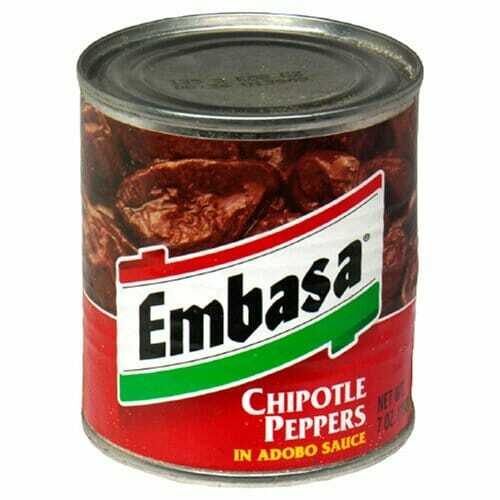 Where to find chipotle peppers – The chipotle peppers in adobo sauce can be found next to those little cans of diced green chiles in the Mexican food isle or the canned tomato products. Even though the cans are quite small, you likely won’t use the whole thing. You can easily transfer them to a ziploc bag and freeze them. If you have fresh peppers, those would work well as a substitute. Freeze & make a double batch – This freezes very well (leave the garnishes out). This recipe doubles easily, and fits perfectly in a 6 qt dutch oven or soup pot. Good base, very forgiving – the shallots, garlic, corn, zucchini and broth make a very good (and somewhat neutral) base for any creamy corn chowder soup. Change up the amount of spices or the spices themselves for a totally different flavor. Taste as you go, and you’ll have a final result to be proud of! Try pairing the corn chowder with a simple chicken sandwich with pepperjack cheese. Chicken cooks quite fast if you want to saute a breast in a pan while the soup cooks. You can also save time by grabbing prepared chicken tenders from a local deli or farmers market. A side baked potato with a little cheese would work well, especially since most classic corn chowder recipes have potatoes in them, but this one doesn’t. Or switch it up and have a baked sweet potato and a side of black beans. I found this recipe on Love & Olive Oil when trying to find ways to use up zucchini several summers ago. I love the simplicity and versatility of Lindsay’s recipe. Sometimes I make it as she describes (which is worth doing at least once!). Other times, like this one, I toy with different flavors. 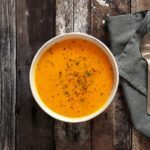 The soup is a very simple base, perfect for adding your own unique spin to it, so be bold. Go crazy. Live a little!